How Do the Nashville Predators Stack up to the Dallas Stars? How Do the Predators Stack up to the Stars? 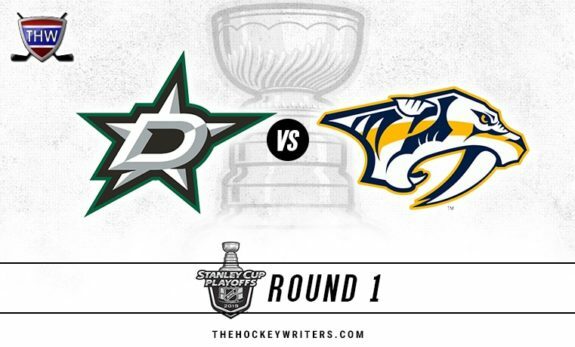 Tonight the Nashville Predators take on the Dallas Stars in the first round of the 2019 Playoffs. As the winner of the Central Division, the Predators have home-ice advantage, while the Stars are the Western Conference’s first wild card team. How do the two teams stack up, and what will be the keys to a Predators series win? Let’s dig into it. The Predators won the Central Division with a 47-29-6 record and 100 points. They won the division by one point after a win over the Chicago Blackhawks on the last day of the regular season. It’s their second straight division title. The Stars finished fourth in the division with a 43-32-7 record and 93 points. They return to the postseason after missing them in 2017-18. This season, the Predators scored 236 goals, 19th-most in the league. 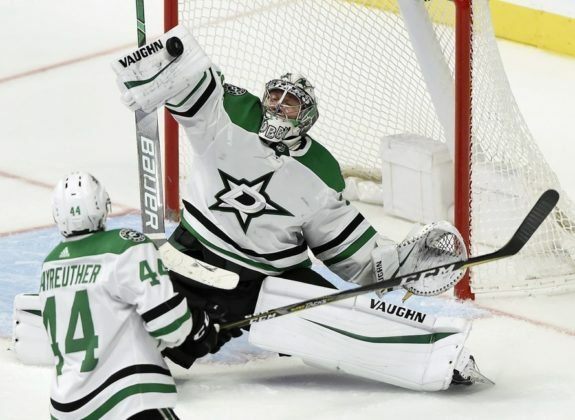 The Stars netted 209 goals, fewest among playoff teams. The Predators allowed 212 goals, tied for third-fewest in the league, with a plus-24 goal differential. The Stars allowed 200 goals, second-fewest in the league, with a plus-nine goal differential. From a special teams perspective, the Stars were the better team. The Stars’ power play converted on 21 percent of chances, 11th in the league, while the Predators had the league’s worst power play at 12.9 percent. 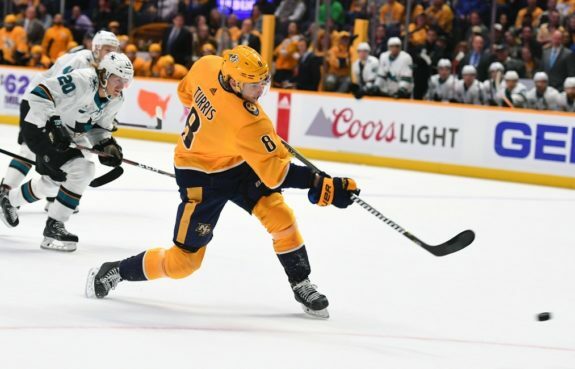 Both teams had strong penalty killing units – the Stars at 82.8 percent, which ranked fifth, and the Predators at 82.1 percent, sixth-best. At five-on-five, the Predators had a 52.2 percent shot share (ninth) and controlled 53.8 percent of goals (eighth). Meanwhile, the Stars had a 49.1 percent shot share (18th) and controlled 50.6 percent of goals (16th). Offensively, the Predators were led by Ryan Johansen’s 50 assists and 64 points and Viktor Arvidsson’s 34 goals. They had three 50-point producers and three 20-goal scorers. They also had four defensemen total at least 30 points. In net, Pekka Rinne and Juuse Saros did well with a team .914 save percentage (SV%), fourth in the league. Tyler Seguin was the driving force behind the Stars’ offense, leading the team with 33 goals, 47 assists and 80 points. They had three players with 50-plus points and three with 20 or more goals. Three Stars defensemen reached the 30-point mark. In goal, Ben Bishop and Anton Khudobin were excellent with a team .923 SV%, second only to the New York Islanders. The Predators and Stars played each other five times during the regular season, with the Predators taking three games. The series was tight with both teams scoring 14 goals. Let’s look at each game of the series. 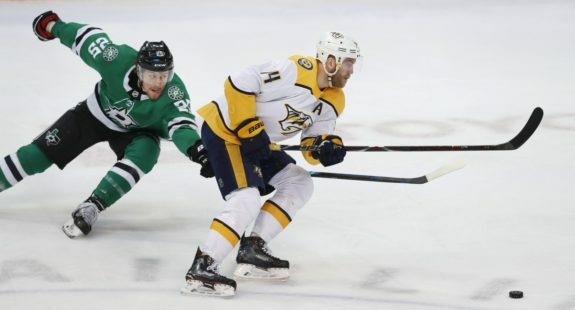 The season’s first matchup between the Predators and Stars may be best remembered as the game when Arvidsson went down with a thumb injury, which kept him out of the lineup until Dec. 27. The Predators went with Rinne in net while the Stars turned to Bishop. Neither was great with both having a sub-.900 SV% in the game. The Stars had a 1-0 lead after the first period and went up 3-1 by the end of the second. The Predators’ Johansen wasted no time in the third cutting into the lead, with a goal 17 seconds into the frame. Yannick Weber tied it less than two minutes later. However, the Stars took the lead again at the 8:58 mark and their 4-3 lead held until Roman Josi tied it on a power-play goal with 43 seconds left in regulation. Mattias Ekholm won it for the Predators 2:27 into overtime and the team left Dallas with the first victory of the regular-season series. Somehow, the Predators played the Stars when Arvidsson went down with injury and again when he returned to the lineup. This time the game was in Nashville, and the road team left with the victory again. Tyler Pitlick got the scoring going for the Stars in the first period and Mattias Janmark followed it up with a goal of his own at the 11:09 mark of the second period. No further goals were scored in the game. Rinne was great in net, turning aside 28 of 30 shots, but it was nothing compared to Khudobin, who stopped all 49 shots the Predators put on net. For the second straight matchup, the Predators faced off in Nashville, and for the second straight time, Khudobin and Rinne got the starts. Rinne wasn’t as good this time, allowing three goals on 26 shots, while Khudobin still performed at a Vezina caliber level, turning aside 38 of 39 shots. Calle Järnkrok scored the Predators’ only goal, 9:35 into the game. Seguin tied it up less than two minutes later and the Stars scored two more in the third to win 3-1. 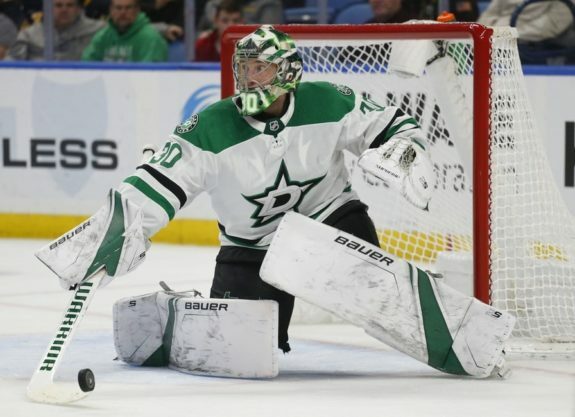 Five days later, the Stars were back in Nashville and Khudobin once again got the start, with Saros getting the start for the Predators. It was a different outcome in this game, as the Predators solved Khudobin, who allowed three goals on 24 shots. Meanwhile, Saros stopped 27 of 29 Stars shots. Craig Smith scored late in the first for the game’s first goal, no one scored in the second, and Miro Heiskanen and Taylor Fedun book-ended an Arvidsson goal in the third to send the game to overtime. Just 43 seconds into the extra frame, Johansen scored the game-winner. The final game of the regular-season series also occurred in February, this time in Dallas. The Predators went back to Rinne while the Stars turned to, you guessed it, Khudobin. Brian Boyle scored in the first to give the Predators a 1-0 lead. Five goals were scored in the second, including three by the Stars, to enter the third tied 3-3. Josi scored twice in the final period, including an empty-netter, to seal the Predators’ victory. For the second straight time, the Predators solved Khudobin. For the Predators to win this series and advance to the second round, there are several aspects they need to focus on, and it all starts with solving Dallas’ goaltending. I’ve already mentioned that the Stars had the second-highest team save percentage during the regular season at .923. And it wasn’t due to the team limiting chances either, as the Stars ranked 16th in shots against. (For context, the Predators ranked ninth). The Stars allowed 30 or fewer shots in 39 games this season, 13th-most, while the Predators had 46 such games, tied for eighth. However, the Stars allowed two or fewer goals in 43 games, second-most in the league behind the Predators and New York Islanders’ 44 games. So the Stars’ success at preventing goals falls squarely on the shoulders of Bishop and Khudobin, and it shows in the goaltender leaderboards. Bishop led the league with a .934 SV%, while Khudobin ranked eighth at .923. Bishop was second in goals-against average with a 1.98 and finished third in shutouts with seven. He also led the league in goals saved above average with 32.24, while Khudobin finished sixth with 16.04. It will be interesting to see who the Stars go with to start the series. Bishop has been their starter all season. He also finished the season with a .950 SV% in his final five appearances. However, he struggled in his only game against the Predators. On the other hand, Khudobin is Bishop’s backup but also had a great season. He ended the season on less of a high note, but still possessed a solid .916 SV%. He started four games against the Predators and shut them down in two of them, although the Predators solved him in the last two matchups. Regardless of who gets the start, the Predators will have to solve the goaltender to get through the series. It means putting shots on net early and often, and bringing a never-ending swarm of offense in which shots come from all angles. 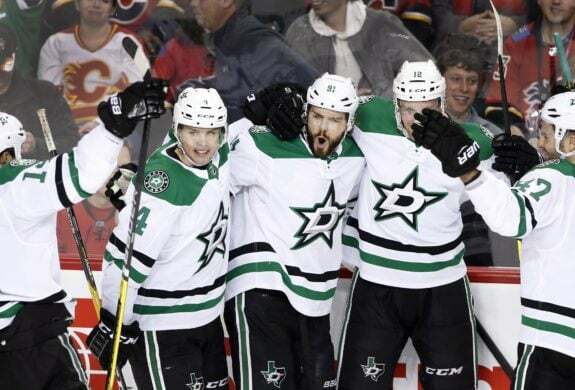 Offensively, the Stars have three forwards who carry the team – Jamie Benn, Alexander Radulov and Seguin. The trio combined for 205 points, 36.2 percent of the team’s points. After Seguin’s 33 goals and 80 points, Radulov totaled 29 goals and 72 points in 70 games and Benn had 27 goals and 53 points in 78 games. No other Stars forward had more than 30 points. So in most games this season if one of the three didn’t produce, the Stars didn’t score. For much of the season, the trio formed the top line, which remains the team’s most used line. However, there were times when head coach Jim Montgomery broke up the line and played either Benn or Radulov on the second line. The goal of this move was to spread out some of the scoring, but when the Stars needed need a goal, the line was put back together. The Stars have other players who can beat you, including a productive defense corps, but shutting down Dallas’ offense starts with Benn, Radulov and Seguin. The biggest area the Predators need to focus on with their own game is creating offense from lines two through four. Like the Stars with Benn, Radulov and Seguin, the Predators’ top line – the JOFA Line of Johansen, Forsberg and Arvidsson – carries the team. The Predators have slightly more offensive depth than the Stars do, yet don’t have the high-end upside of a Seguin. If given the chance, the JOFA Line can rip a defense apart. They’re great at cycling the puck, transitioning through all three zones, getting shots on net and scoring at a high level. But it remains just one line, and can be matched against and potentially hindered by a shutdown defense pair. Because of that, the Predators have to get depth scoring to have a chance to win the series. They have talent on all four lines, but individual players need to start converting. This mostly falls on the shoulders of the second line of Mikael Granlund, Craig Smith and Kyle Turris. Smith had another strong, 20-goal season, but Turris struggled and Granlund was still finding his place on the roster after the Predators acquired him at the trade deadline. 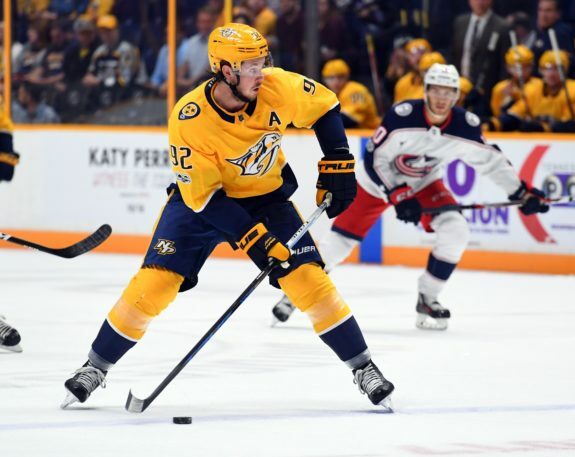 A top-six is vital for any team that wants to be a serious Stanley Cup contender, and it’s perhaps more important for the Predators as it would take the strain of scoring off the top line. Getting the second line going would also mean that the third and fourth lines focus on forechecking and cycling the puck throughout the offensive zone, tiring out the opposition just in time for the JOFA Line to hit the ice again. If the Predators follow these keys, they should win the series, as they did in the regular season. They’re the more talented and balanced team, even if they didn’t play like it all season. They did, however, play their best hockey of the season down the stretch and Rinne looks dialed in heading into the postseason. The Stars won’t be an easy out. They have great goaltending, a productive defense and a dynamite top line. But the Predators have all those elements, as well. Because of that, I think the Predators win the series in six games.